Fortunately, there are a number of establishments throughout San Francisco and beyond that offer good, unpretentious reading environments while serving up a variety of excellent brews. Following are five favorites. 1) Vesuvio Cafe: A combination neighborhood bar, tourist spot and pilgrimage site, Vesuvio’s has a rich literary history that’s closely linked to San Francisco’s Beat era. Located next door to fabled City Lights bookstore, the writers and poets who congregated at Lawrence Ferlinghetti’s shop would usually end up at the bar across the alley (since renamed Jack Kerouac Alley), and still do. And since I can never go to North Beach without a trip to City Lights, and never seem to walk out without buying a book, Vesuvio’s is a great place to dive into your new purchase while soaking up the aura of all the great writers gone by. Get a window seat in the upstairs loft for great people watching too. It’s a full bar, so you have plenty of choices. 2) Blue Danube: An underrated cafe in an overlooked neighborhood, this inner Richmond institution is as comfortable as an old couch in the living room of a well-worn Victorian. Blue Danube is the epitome of the West Coast coffeehouse: a bohemian third place that’s both extended living room and a warm refuge against the cold and fog. It’s not big, but there’s usually a seat on one of three couches or tables. And on warm days the front windows open up for a lazy day of reading. Anchor Steam and Fat Tire on tap. 3) Java Beach: Unless you live in the outer Sunset, this one might take some effort to get to. A stone’s throw from Ocean Beach and the Great Highway at the end of the N Judah line, Java Beach is a great little neighborhood cafe (consolation for locals putting up with all that fog). Patrons take advantage of the outdoor patio–a great place on a sunny day–or the cozy interior when it’s cold and foggy. Either way, the weather is conducive to reading, and they have some nice amber ales on tap. The food is a cut above other typical cafe fare too. 4) Atlas Cafe: Surprisingly, there’s not as many beer-friendly coffee hangouts in the Mission as you might think. But Atlas Cafe has been a consistent cafe option in the neighborhood (on 20th at the Portrero) for years. A little off the beaten path and away from the buzz of Valencia or Mission streets, Atlas is a sunny little place with an outdoor patio, mostly table seating and a fancy menu compared to most cafes, serving items like apple and goat cheese pizza. 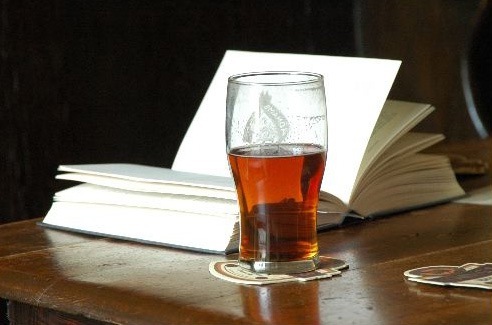 With a nice selection of draft and bottled beer, it’s a very easy place to wile away an afternoon with a good book. Great bluegrass music on Thursday evenings and ragtime/blues on Saturday afternoon, make a nice soundtrack for that William Faulkner novel. 5) The Grove: A bit on the trendy and pricey side, not surprising given their locations in the Marina, Hayes Valley, Pacific Heights and SOMA. But the Grove redeems itself with an excellent draft and bottled beer selection, including Anchor Porter and several types of Chimay. Each location has a rustic-kitsch design, made to look like some roadside place you’d find around Tahoe. Which means there are fireplaces, leather chairs and hard wood everything throughout. Find a chair by the fire, buy a beer and enjoy your book.